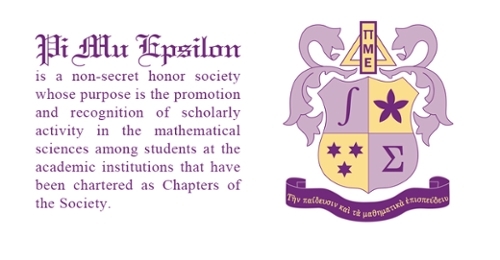 Northwestern has a chapter (Beta of Illinois) of the national Math Honor Society Pi Mu Epsilon, which was founded in 1914 to promote scholarly activity in mathematics among students in academic institutions. Those meeting these criteria should print and fill out the Pi Mu Epsilon application form, attach a copy of their unofficial transcript from CAESAR, and bring the completed application and transcript to the Math office on the second floor of Lunt. For more information on the organization, visit Pi Mu Epsilon.